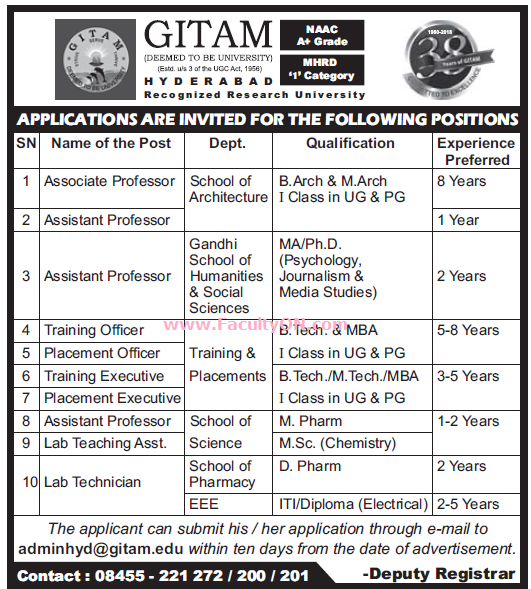 GITAM University, Hyderabad has advertised in the EENADU newspaper for recruitment of Associate Professor / Assistant Professor Plus Non-Faculty jobs vacancies. Interested and eligible job aspirants are requested to apply within 10 days from 10th July 2018. Check out further more details below. About University: During the past 33 years, GITAM has been committed to excellence in higher education foraying into diversified disciplines of learning. It has steadily evolved into a world class university recognized for the experiential learning it offers, the competent and compassionate faculty, the stellar research laboratories, academic vibrancy and cosmopolitan culture. Dr. MVVS Murthi, visionary, industrialist, educationist, philanthropist and former parliamentarian has been guiding the destinies of the University since its inception. How to Apply: Interested and eligible candidates are requested to send CV along with all copies of certificates / testimonials and recent PP size photos to the email address provided here.